Father has chosen the Day of Atonement, and the time of the 200th Anniversary of a covenant kept between Natives, Blacks and Whites who went on the Trail of Tears together from this place. He longs to meet with us. Come as you are, expecting to meet with Him. Feel free to wear your regalia. There is plenty of room to dance. Father has anointed Robby and Beyond the Veil to lead our response as His Son’s bride. 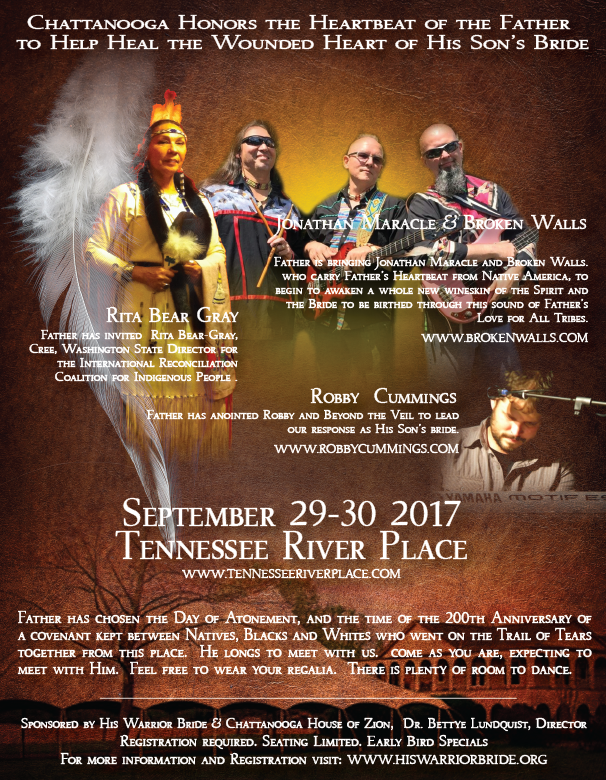 Father is bringing Jonathan Maracle and Broken Walls, who carry Father’s Heartbeat from Native America, to begin to awaken a whole new wineskin of the Spirit and the Bride to be birthed through this sound of Father’s Love for All Tribes. Father has invited Rita Bear-Gray, Cree, Washington State Director for the International Reconciliation Coalition for Indigenous People . Father has thrilled our hearts by inviting James and Robyn Vincent, awesome apostolic and prophetic team sent out by Chuck Pierce to us. They complete the Brainerd Mission Covenant picture of One New Man all grafted into Israel.